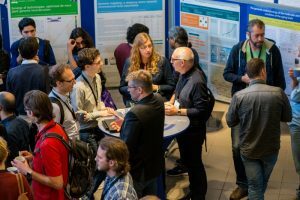 Professor Peter-Bram ‘t Hoen (Radboudumc) and Professor Morris Swertz (UMC Groningen and Groningen University) will organise a workshop ‘Shaping the national digital infrastructure for large (cross-)omics projects’ at the DTL Communities@Work conference on 2 October 2018 in Utrecht. The Netherlands X-omics Initiative, ELIXIR-NL, and Health-RI are involved as co-organisers. Are you active in (cross-)omics research projects in the life sciences (e.g., health, agro, microbial, ecology)? Are you integrating omics information with other data sources? Are you responsible for the data stewardship and/or data analysis and data integration in these projects? Then, please join us in this workshop to identify the common challenges we all face in dealing with omics data. We will explore how we can learn from past projects and benefit from best practices. We will discuss a common model to support our studies, and jointly prioritise efforts to build a national digital research infrastructure for the broader life sciences. What ICT efforts are needed? How can we create secure virtual research environments to collaborate? How can we make data FAIR at-the-source and provide the necessary interoperability services to support cross-omics analysis? How can we connect to European infrastructures? Leads and participants of data-intensive projects: the research community applying omics technologies, facility managers, bioinformaticians and data stewards across life science fields. Colleagues from the Dutch genomics, proteomics, metabolomics and other omics labs and facilities, as well as associated bioinformatics and data stewardship teams. Labs connecting other data sources with omics information. This entry was posted in ELIXIR, Technologies, FAIR data, Event, Health-RI, Large-scale research infrastructure.